This is an advanced sequential file organization method. Here records are stored in order of primary key in the file. Using the primary key, the records are sorted. For each primary key, an index value is generated and mapped with the record. This index is nothing but the address of record in the file. 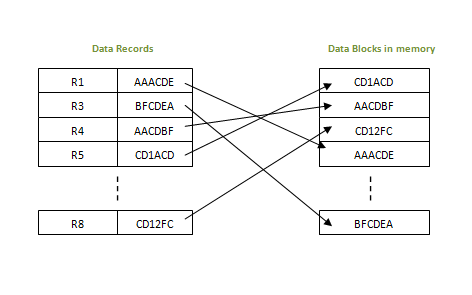 In this method, if any record has to be retrieved, based on its index value, the data block address is fetched and the record is retrieved from memory. Since each record has its data block address, searching for a record in larger database is easy and quick. There is no extra effort to search records. But proper primary key has to be selected to make ISAM efficient. This method gives flexibility of using any column as key field and index will be generated based on that. In addition to the primary key and its index, we can have index generated for other fields too. Hence searching becomes more efficient, if there is search based on columns other than primary key. It supports range retrieval, partial retrieval of records. Since the index is based on the key value, we can retrieve the data for the given range of values. In the same way, when a partial key value is provided, say student names starting with ‘JA’ can also be searched easily. An extra cost to maintain index has to be afforded. i.e. ; we need to have extra space in the disk to store this index value. When there is multiple key-index combinations, the disk space will also increase. As the new records are inserted, these files have to be restructured to maintain the sequence. Similarly, when the record is deleted, the space used by it needs to be released. Else, the performance of the database will slow down.